This unique and casual dining destination features a variety of locally sourced menu options with scenic views of the Cuyahoga River and easily accessed recreational opportunities nearby. Located on the Cuyahoga River's Irishtown Bend, Merwin's Wharf features stunning views of water and wildlife with nearby connections to recreational opportunities. 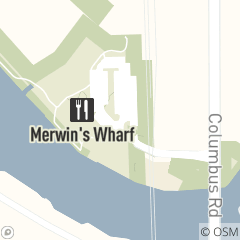 Nestled in the post-industrial site of Cleveland’s Flats neighborhood, Merwin’s Wharf’s connects guests to urban greenspace while enjoying fresh, seasonal and locally-sourced menu items. Noble H. Merwin arrived in Cleveland around 1812. Like most of his neighbors, he was a New Englander, born in Milford, Connecticut in 1782. He made the long trek to Cleveland with his young family and became one of the first merchants and wholesale dealers in the primitive town. Noble Merwin first purchased a log tavern at the intersection of Superior and Vinyard. He then turned his attention to the flat meadows lying within the ox-bow of the river, buying property along the northwest side of the peninsula. He had hopes of providing supplies for the Army, American Fur Company and perhaps, even the American Indians living along the shores of the Great Lakes. He built a packing and slaughterhouse for droves of cattle and hogs that were brought to the city, as well as a warehouse at the east end of the street that bears his name. He constructed small lake vessels, including the schooner Minerva, the first vessel registered at Washington from Cuyahoga County. Merwin did all this before the construction of the Ohio and Erie Canal that would make his land investments so profitable. According to some memoirs, Noble Merwin was part of the Cleveland delegation that headed down to Akron to meet the officials traveling along the newly opened Ohio and Erie Canal and escorted them to Cleveland for the opening ceremonies in 1827. We want to hear about your dining experience. Please submit your feedback. Please call for pricing. Used by permit only for wedding rehearsals, corporate/business, showers and birthday parties. Cleveland Metroparks is the exclusive caterer.